Priced to sell First floor has 3 BRS, DR, large eat-in Kit, Large LR with stone FP, 2nd Floor tenant would like to stay (this apt needs more TLC which could be done once tenant leaves), House is being sold with two extra 50 X 150 lots which could be built on, Roof newer, two new hot water heaters, new carpet on first floor CV schools, close to stores, bus etc. Port Dickinson Elementary School Pre-School, Elementary School / Public N/A 1.72 mi. Chenango Bridge Elementary School Elementary School / Public 5 1.76 mi. Chenango Valley Middle School Middle School / Public 7 1.3 mi. Chenango Valley High School High School / Public 7 1.3 mi. Central Baptist Christian Academy * Elementary School, Middle School, High School / Private N/A 1.75 mi. Children's Home Of Wyoming Conference * Elementary School, Middle School, High School / Private N/A 1.03 mi. 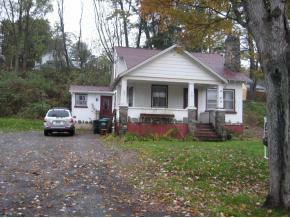 79 Grant Road, Binghamton, NY 13901 multi-family home was sold for $36,500.